For me, this is a purely nostalgic recipe. I’ve looked at the recipe in my recipe book several times but I haven’t eaten/made these in like 10 years or so. I just like the memory of them! 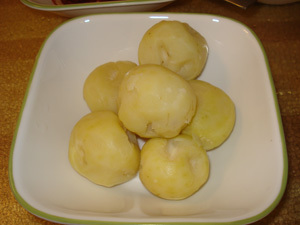 My granny made lovely pack potatoes for iftar in Ramadhan. It’s a cold rainy afternoon, so I thought I could do with some cheering up! 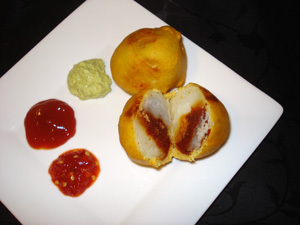 Pack potatoes are basically boiled potatoes with a filling of tangy chili paste, dipped in a gram flour batter and deep-fried. Boil the potatoes in its skin till a knife pierces through the potato easily. I used nugget potatoes and I needed to boil it for 18 mins. I like to use nugget potatoes since it results in the final product being round. When done, dip them in cool water and peel off the potato skin gently. Remove any eyes. 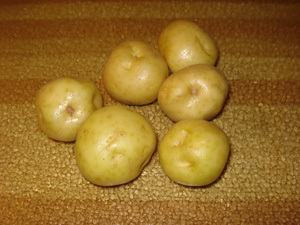 If using the small potatoes, cut them in half (equally), keeping the top and bottom of each potato together (matching). 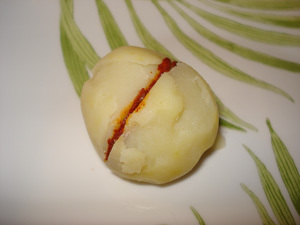 If using the larger potatoes, quarter them, matching two quarters to make a half. In a bowl, mix the gram flour, white flour and salt. 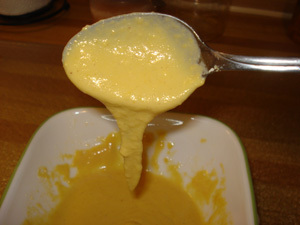 Add some water to make a batter. The consistency should be slightly more runny then a pancake batter. I like to make the batter salty, since I like salty potatoes. 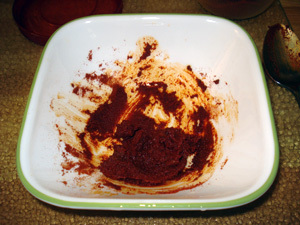 In another bowl, mix the red chili powder and lemon juice to make a very thick paste (so use lemon juice accordingly). Add a pinch of salt and mix thoroughly. Heat the oil in a wok or karai on medium-high heat. The oil should be deep enough to completely submerge the potato or at least come three-quarter way up. 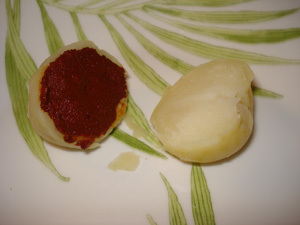 Put some chili paste on the potato half and join it with its other half. It will stay together since the chili paste is thick. 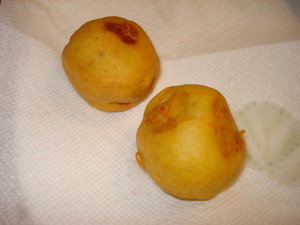 Test the oil temperature by dropping a little of the gram flour batter into the oil. It should float up almost immediately. 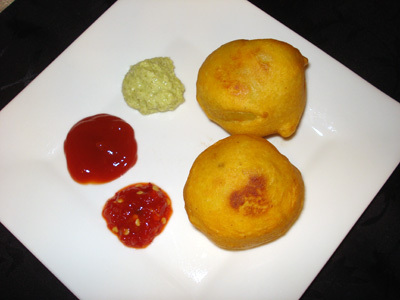 Dip the potato into the gram flour batter and place it into the oil gently. 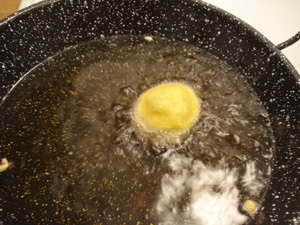 Gently splash some oil over the top of the potato if the oil does not completely submerge it. Bloat on paper towels, best if served immediately. Hello! I realy want packpotatoes,where can i get in dar? This is a canadian blog, so cant help. I had to adapt this recipe because my nieces can’t eat chilli. Otherwise another hit recipe.